Ace Alliance Power Managing Director Md Mozammel Hossain, Summit Power Managing Director Engr Abdul Wadud and LankaBangla Finance Managing Director and CEO Khwaja Shahriar are seen at a ceremony marking the closing of subscription to preference shares of Summit Alliance Power, at InterContinental Dhaka recently. 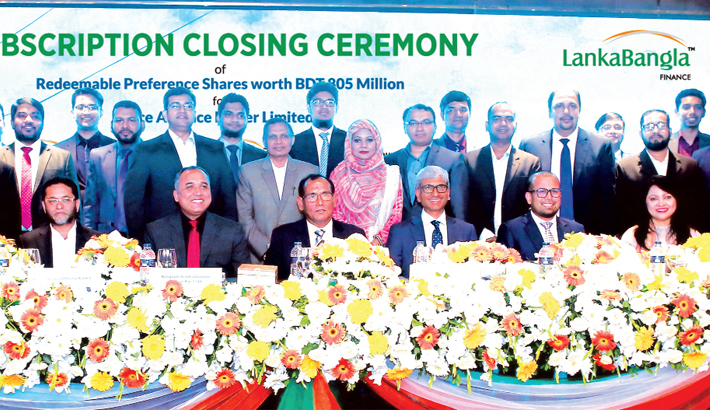 A subscription closing ceremony to raise capital through issuance of preference shares worth about Tk 805 million for Ace Alliance Power Limited, a concern of Summit Group, was held at InterContinental Dhaka. LankaBangla Finance Limited acted as the mandated arranger, LankaBangla Investments Limited acted as the issue manager and BRAC Bank Limited acted as the agent, account bank and custodian bank for the transaction, said a press release. The programme was attended by Md Mozammel Hossain, Managing Director of Ace Alliance Power Limited, Lt Gen (retd) Engr. Abdul Wadud, Managing Director of Summit Power Limited, Khwaja Shahriar, Managing Director and CEO of LankaBangla Finance Limited, Mohammed Nasir Uddin Chowdhury, Managing Director of LankaBangla Capital Market Operations, SM Formanul Islam, Executive Director and CEO of Bangladesh Infrastructure Finance Fund Limited, Md Mehmood Husain, Managing Director of NRB Bank Limited.